We help our community celebrate life by enjoying the outdoor playground. Though the Fresh Adventures family come from all walks of life, we all have one thing in common- wilderness. No matter where life takes us we're always welcomed back to the comforting embrace of the great outdoors. From adrenaline pumping adventures to that magical moment of relaxation at sunset, we take comfort knowing that our playground is always awaiting. That is what drives us to continue finding our next adventure and to help you find your perfect adventure tour. We know that making the most of the outdoors can get pretty crazy, so for us safety is paramount. We're committed to making every moment as safe and relaxing as possible, in order to provide the maximum comfort for our guests. Our guides have a wealth of life experience and leadership training, which we're all eager to share. All of our guides are highly trained in first aid, and work towards further certifications including swift water rescue, rope rescue, life guarding, ski patrol training and much more. 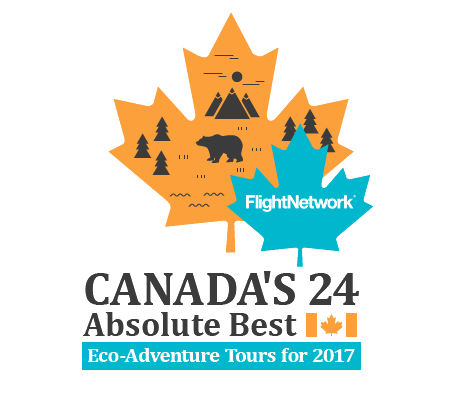 We strive to run the best possible adventure tours in Canada, and doing so requires attention to detail. Our guides are carefully selected for their personality, and we work hard to make each moment a special one for you. When driving conditions are terrible, your tour guide is right at home, relaxed and ready to respond to your every need. If nature throws a curve ball at us, your guides are in their element, and able to focus on making your adventure tour special. Our wilderness guides believe in integrity and reliability, and turn leadership into a lifestyle. We have been there and done that and that is why we are here to help you get there and do that. We know that we are nothing without a supporting community so we take pride in giving as much as we can back. We do everything we can to help our community flourish, such as supporting local businesses, or helping educate the next generation of adventurers. From lessons we've learned to moral support and guidance we are eager to share with you. Our guides come with a wealth of life experience and knowledge, and we are happy to help you grow yourself, while on one of our adventure tours. We survive because of the continuity of the wilderness and resources we have access to. In an age where things are consumed so quickly and little thought is given to tomorrow, we do what we can to make sure tomorrow is just as fun as today. We lead by example when it comes to caring for the environment, from choosing routes that make the least impact, to recycling, to sourcing as much local service and product as possible. Our staff are involved in continuing education to learn how we can be just a little more gentle on the earth. We rest knowing that we leave no trace, and tomorrow will be just as incredible as today.